When a man becomes a Missionary Oblate, he must be willing to accept an assignment wherever and whenever he is needed. Father Elvis Mwamba, O.M.I. experienced that requirement just a few days after becoming an Oblate priest. Father Elvis was ordained in his native Zambia in July. When he received his first assignment he was shocked. He would become part of the ministry team at the National Shrine of Our Lady of the Snows, in a country that he had never even visited. Father Elvis is now part of the pilgrimage team at the Shrine. He is primarily responsible for helping pilgrims discover new aspects of their faith and to have an enriching experience during their visit to the Shrine. Father Elvis comes to the Shrine with an unconventional background. He was born in the Kabwe area of Zambia where he grew up with his mom, a sister and brother. Father Elvis’ dad passed away when he was just six years old. At age seven, Fr. Elvis was already thinking that he wanted to be a priest. He would accompany his aunt on long walks to a village to attend Mass. The priests inspired the youngster to follow his heart to religious life. But Fr. Elvis had a dilemma. His family was struggling financially and a priestly life would not help his family pay their bills. But Fr. Elvis’ mother could see that her son truly needed to be of service to the Church, and gave her blessing for him to enter priestly formation. Father Elvis was expecting to become a diocesan priest, but a tragedy altered those plans. His diocesan pastor, and mentor, was murdered during a robbery. After the murder Elvis had little guidance to his calling for religious life. Then he learned about the Missionary Oblates. Father Elvis joined the Oblates in 2007 and spent two years in the pre-novitiate program in Lusaka, Zambia. During these early days of discerning his calling, Fr. Elvis found a new mentor, Fr. David Kalert, O.M.I. Father Kalert was a former Provincial for the Oblates in the United States and had also been Director of the Missionary Association, the fundraising office of the Oblates located near the National Shrine of Our Lady of the Snows. Father Elvis said he and the other members of the pre-novitiate community considered Fr. David to be their Moses. 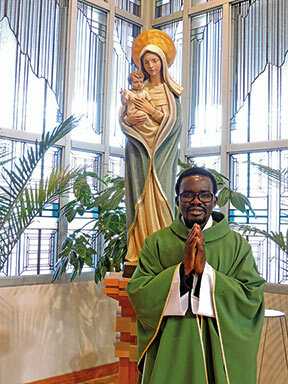 Father Elvis completed his novitiate year in South Africa and then spent several years studying at the Oblates’ St. Joseph’s Institute in South Africa. During that time he often visited the Ngome Marian Shrine, a small shrine operated by the Oblates as a spiritual oasis in the South African countryside. After a pastoral year at an Oblate parish in Zambia, Fr. Elvis was then chosen to study at the Oblates’ international scholasticate in Rome. During his first week in Rome, Fr. Elvis received the news that his mom had passed away unexpectedly. Father Elvis spent three years in Rome studying with Oblate seminarians from around the world. Living and studying with so many people from different backgrounds and cultures opened Fr. Elvis’ eyes to the diversity of the Church, a diversity that he hopes to highlight while ministering at the Shrine. Father Elvis was ordained to the priesthood on July 7, 2018. Six other Oblates were also ordained at the ceremony which had been delayed for several months because of a cholera epidemic in the area. Father Kalert, their Moses figure, was present at the five-hour Mass. It took about three months for Fr. Elvis to get all of the paperwork in order to begin his ministry in the United States. He arrived at the Shrine in November and his constant smile quickly endeared him to the Shrine staff and pilgrims. Father Elvis will likely spend about three years at the Shrine before receiving his next assignment. “I don’t know what tomorrow will hold for me, but I know that I will trust in the Lord and everything will turn out beautiful,” said Fr. Elvis.